The Bureau of Reclamation, in partnership with the U.S. 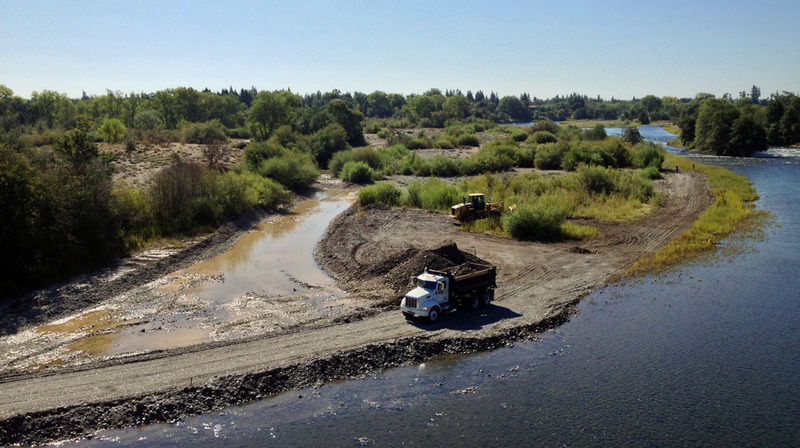 Fish and Wildlife Service, Water Forum, Fish and Wildlife, and Sacramento County Regional Parks began a “River Salmon Spawning Gravel Augmentation Project” that will continue through September 27, 2013. Large tractors are working just downstream from the pedestrian bridge at River Bend Park. They will be moving 6,000 tons of gravel into the area to improve the spawning habitat for Salmon. The project is expected to improve 5,500 square yards of habitat. The working hours will be Monday through Friday from 7:00am to 5:00pm. The pedestrian bridge is an excellent place to observe the work site activities. The salmon habitat project is part of the 1992 Central Valley Project Improvement Act which requires improvements to spawning gravel and rearing habitat. $410,000 dollars is the cost for this project. Contact Douglas Kleinsmith at 916-978-5106 for additional information.